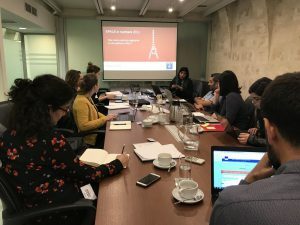 The new Erasmus+ KA2 project ICT 4 the Elderly, implemented by ALL DIGITAL member organisations, was launched on the 13 and 14 November 2018 in Malta. Malta Communications Authority will coordinate the project, which will involve ALL DIGITAL and three other partners: Simbioza Genesis from Slovenia, Foundation Ynternet.org from Switzerland, Stiftung Digitale Chancen from Germany. The ICT 4 the Elderly project aims to facilitate a pathway for up-skilling the digital competences of individuals between 55 and 75 and to make them aware of some of the many opportunities that the Internet offers. In order to do so, the project first foresees the collection of best practices from other successful projects to be used to develop a training manual and an online academy. Once the training materials are ready, individuals aged 55-75 will be selected through a call for applicants and will take part in the piloting as ambassadors of the project. Two pilots with 12 people each will take place in Malta and in Berlin. To assess the project results’, policy recommendations will be produced to reach policy makers and training providers. Project partners gathered in Malta on 13-14 November to discuss the project activities. The first day of the kick off meeting took place in Saint Julian where project partners had the opportunity to know each other. At the beginning of the meeting, each partner’s representative introduced themselves and their organisations. Afterwards, the project coordinator from MCA gave an overview of the project. Project partners went through each intellectual output defining different tasks. ALL DIGITAL will be specifically involved in the production of policy recommendations for future project results transferability and up-scaling addressed to policy makers and training providers. An exploitation roadmap will be produced as well, including potential policy makers and key stakeholders at local, regional, national and EU level. ALL DIGITAL will also contribute to the research on best practices and open educational resources at EU level and in the dissemination activities. On the second day of the meeting, project partners met in La Valletta and visited MCA offices. The discussion was devoted to management and financial issue as well as to dissemination activities. They also took part in a workshop on EPALE Platform, which will be used for dissemination purposes. The kick off meeting was very productive as everything went according to the schedule and project partners could plan all future activities and events. A multiplier event will be organised in each project country and it will involve different stakeholders. The final project meeting and International Workshop will be combined with the TEDx Conference in Geneva and it will be focused on the project results and policy recommendations. The next face-to-face meeting with all the partners will take place at the end of March 2019, in Berlin.